Black steel partition for the Jeep Liberty helps keep cargo and pets safe and secure in the cargo area and prevents either from entering the passenger compartment. 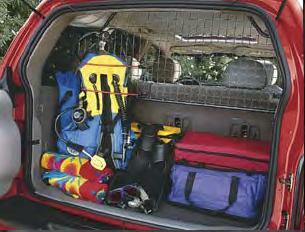 Features grid construction that does not affect rear view mirror visibility or ability to fold down rear seat. Custom fit to match the vehicle's interior. Upper Compartment Partition, as shown.